North Korea has reopened a once dormant telephone hotline that links directly to South Korea, and the two countries spoke for 20 minutes, this in advance of the North-South Korean meeting that it slated for next week to discuss the Winter Olympics. North Korean dictator Kim Jong Un reportedly ordered the hotline open at 3 p.m. local time Wednesday, and North Koreans made the first contact. CNN reported explicit details of the two phone calls – one from 3:30 to 3:50 p.m. local time, and another at 6:07 p.m. local time in South Korea. The nations checked out technical issues during the first 20-minute call, and the second call was to suggest they wrap up for the day, the South Korean Unification Ministry told CNN. The calls appeared to be only technical in nature, to make sure the hotline was up and running, although it was unclear what was discussed. However, South Korea seemed very pleased with these first steps toward more communication. “It creates an environment where communication will be possible at all times,” he said. The red and green phone system is one of 33 direct lines that the two countries once used to communicate. 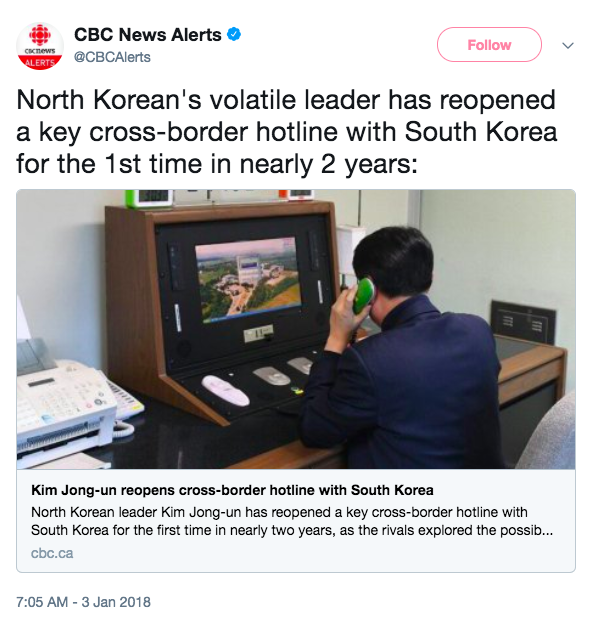 The particular hotline that has been reopened is located in the village of Panmunjom, which is a border village in the Demilitarized Zone (DMZ) that separates North and South Korea. North and South Korea haven’t had high-level talks in two years, since December 2015. South Korea offered to hold talks with North Korea in order to discuss North Korea’s participation in the upcoming Winter Olympics. The talks would potentially include discussion about North Korean decentralization. That offer for talks came just one day after Kim Jong Un’s New Year’s Day address, when he said he was “open to dialogue” with Seoul so that North Korean athletes could participate in the Winter Olympics.